Location: Tswalu Kalahari Reserve, South Africa. 3 positions: approx 15th Oct 2013 - 30th April 2014 (flexible). 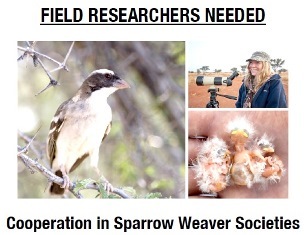 We are seeking three enthusiastic research assistants to join our team studying white-browed sparrow weavers in the Kalahari desert, South Africa. The project is investigating the social dynamics of cooperative breeding, by asking evolutionary and mechanistic questions about parenting, cooperation and dispersal. The project is led by Andy Young, University of Exeter, and is based in Tswalu Kalahari Reserve where we have been studying 30+ groups for the past 3 years. For more information on the sparrow weaver project see here. The positions will entail work during the peak breeding season (15th October - 30th April; with some flexibility). The fieldwork will involve the collection of key behavioural and life-history data from eggs, chicks and birds, and the capture and processing of adult birds. Applicants should be enthusiastic, hardworking and physically fit and hold a driving licence. Previous field experience (particularly any bird handling/ringing experience) is desirable, but not essential - training in all field skills will be provided. Food and accommodation expenses will be covered while in the field and a contribution can also be made towards travel costs. Closing date: 18 August 2013 - see here.